We're excited to share that our designs for HONOLULU Fashion Week, presented by Hawaiian Airlines has been selected as a finalist for the 2016 BizBash Event Style Awards, Best Trade or Consumer Show category! BizBash is the leading trade media for the event industry and their "Event Style Awards" honor creativity, innovation, and excellence in the meeting and event industry throughout North America. There were nearly 1,000 submissions this year and we’re thrilled to be on the same stage as the brands in this year’s current nominations within our category—-the New York International Auto Show and Fête Chinoise. Read more about our installations in our Honolulu Fashion Week case study. Design and fashion are a natural pairing and we’ve often looked to the fashion world for inspiration. So we were beyond thrilled and honored to be part of the Creative Design Team to help bring the 2nd annual Honolulu Fashion Week (HFW) to life. Launched in 2014, HFW is a 3-day event bringing together some of Hawaii’s top emerging and established fashion designers, as well as local brands. In addition, our bright local talent shared the runway and spotlight with other national and internationally renowned designers. Guests were invited to stellar fashion shows produced by the incredible Lynne O'Neill and a team of fashion heavy-hitters from New York City (with a lot of them actually being from our islands and/or having ties to Hawaii). Led by Honolulu Magazine, the HFW Creative Design Team was tasked to conceptualize the overall look and feel, which included key areas such as the entry, HFW Marketplace, and lounge. Not only were we committed to designing an event that was reminiscent and comparable to other fashion week events around the world, but we wanted to maintain a distinct voice and identity that represented Hawaii in a progressive, forward-thinking, and elevated way. Along with artists and co-collaborators, John Koga and Lawrence Seward, our goal was to translate the HFW brand and identity into the physical environment. HFW was led by Honolulu Magazine and presenting sponsor, Hawaiian Airlines. As the first impression, it was important that the entry was welcoming, provided direction, and set the tone for the guest experience. To achieve this, we leveraged the HFW graphics and imagery to greet guests as they entered. The center graphic also served as an oversized step-and-repeat (the perfect selfie backdrop for the stylish guests!). With soaring ceilings, we suspended banners to fill the space and provide visual impact. Comfortable seating zones with sleek furniture from INspirations Interiors were also placed in the space to allow guests the opportunity to gather, socialize, and enjoy the experience. 8' tall banners were suspended in the air to help greet guests and draw them into the Marketplace. A 19' wide custom graphic featured black and white imagery from last year's HFW. The design of the entry and marketplace were inspired by the HFW creative-- from imagery to colors, and shapes. Housing over 50 local brands to showcase their wares and services, the Marketplace was designed to create a clean and functional layout while maximizing the footprint for designers to setup shop and offer their products to sell. The space plan leveraged two main aisles and signage was designed in bold neon colors and a triangle pattern to mimic colors and shapes from the HFW creative. Adjacent to the Marketplace, an exhibition of locally made art was skillfully presented by John Koga and Lawrence Seaward, as a tie to the many other design disciplines. Available for purchase, a portion of proceeds from each piece were donated to support the official nonprofit of HFW, called Reach the Runway. Reach the Runway creates mentorship opportunities for Oahu middle-school students interested in pursuing a career in the fashion industry. Color-coded signage helped guests identify the location of the designer's booths. Custom signage were designed in triangle formations to mimic the HFW creative. Curated art pieces by one of Hawaii’s most established and respected artists, John Koga. Several elements set the stage for "The Hub," including a world map backdrop featuring Hawaiian Airlines flight routes, key elements of airline travel presented in unique ways, and dramatic lighting to evoke the feeling of flying through the night sky. As the presenting sponsor, Hawaiian Airlines played a major part in this year's HFW. We were honored once again to conceptualized their entire activation area, which included a pop-up retail component, lounge, and exhibit. Our goal was to design a space that reflected a sense of place while celebrating the airlines' international destinations. To achieve this, we leveraged the world map as a main backdrop--using Hawaiian Airlines' destination cities and having Hawaii as the hub (which inspired the name of the lounge). Measuring over 50' wide and 16' tall, the massive map was the perfect opportunity to introduce their brand and highlight their routes. We then anchored the space with a 8' diameter x 7' tall circular chandelier comprised of thousands of custom made baggage tags representing some of Hawaiian Airlines gateway cities. Not only did this design element fit with "The Hub" concept, but it tied into their fashion show theme, titled "Runway to Runway." Tags were individually strung together and hung in a cascading formation with the Honolulu tags positioned at the center of the chandelier to represent Hawaii as another landmark destination of fashion and the hub for the beloved hometown airline. The chandelier was illuminated in gradient hues of purples and blues, and positioned over a circular acrylic bar. Baggage tags were custom designed, printed, and meticulously strung together to form the chandelier. As a main focal element, the chandelier was suspended 16.5' in the air. Each individual strand was hand-positioned in a circular design to form the chandelier. We produced custom retail fixtures to showcase and merchandise two of Hawaiian Airlines' collections--their Summer Destination Collection and the launch of their Heritage Collection, a partnership with local brand Tori Richards. Each of the collections were carefully curated and merchandised to provide guests the opportunity to explore and shop. Vinyl wrapped beverage carts served as pop-up cash wraps for guests to purchase product. Mannequins dressed in the Heritage collection featuring designs by Tori Richards. Garments from the Summer Destination Collection merchandised for visual impact. Custom designed banners helped delineate the space. 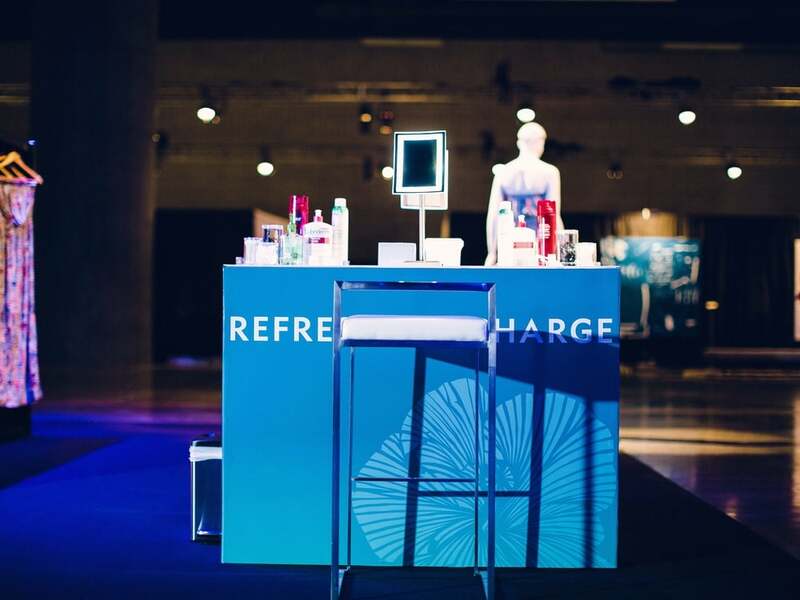 As an additional layer to the "Runway to Runway" theme, we also designed and incorporated "Refresh + Recharge" stations where guests could recharge their mobile devices and quickly freshen up while shopping the collections. The custom-branded stations contained a variety of beauty products for folks to freshen up. Featuring a variety of charging cables, the recharge station helped keep guests connected all day long. Illuminated LED mirrors were mounted onto each station, which was covered in sleek white acrylic tops. Lastly, the lounges featured modern furniture from INspirations Interiors to create comfortable and stylish seating zones, and an area for guests to watch special content and a live stream of the various fashion shows playing throughout the weekend on a large LED screen--the perfect mix of form and function. At the center of the Hub we curated the "Cabin[to]Couture" exhibit where emerging designers upcylced and transformed old aircraft seat fabric and materials into one-of-a-kind fashion pieces. Watch this video by Hawaiian Airlines to learn more on how these local designers showcased their talent and craft. Graduates of Honolulu Community College's (HonCC) Fashion Technology Program and participating designers from The Cut Collective + Creative Lab's Fashion Immersive Program welcomed the airline's "Cabin[to]Couture" project as a platform to showcase their skills using material from Hawaiian Airlines Boeing B717 aircraft. Honolulu Fashion Week 2015 was an incredible experience and it definitely took a village to pull the entire event together. As Fashion Week is a major event across the globe, it’s exciting to see our very own fashion week come to life here on the islands to help showcase high fashion and design in Hawaii. A HUGE MAHALO to the Honolulu Magazine and Hawaiian Airlines teams for having us be a part of this wonderful experience. Lighting: Bernard Link Theatrical, LLC. Pipe & Drape: Attco, Inc.